Potatoes are a great food accompaniment all over the world and have immense health benefits as well. But apart from its taste and ability to match up with all kinds of food, they are great for hair too. Loaded with the goodness of iron, potassium, fiber, protein and vitamins, potatoes help in strengthening the hair follicles apart from naturally covering the greys. Potatoes for hair work as perfect antidotes for problems like dryness, split ends, dandruff and even hair breakage and loss. This potato hair mask is the right treatment for dry and frizzy hair. Both honey and egg used in the mask work as excellent natural conditioners and moisturize the scalp as well, while the potato juice promotes healthy hair growth. Both potato and onion juice work as antiseptic for the hair and scalp, cleaning it off the bacteria and fungi that cause infections and dandruff. Both the juices also work as hair growth boosting potions. Using potato peel for hair can be really beneficial through this mask. Both potato and aloe vera moisturize the hair, making them soft and shiny. Aloe vera also has anti-microbial properties that promote scalp health. Use potato peel for grey hair and see how vibrant they become. Potatoes work as natural bleach and applying the peel on hair can cover all greys. Add to it the goodness of amla hair oil, and what you’d get in return are strong, thick and black shiny hair. 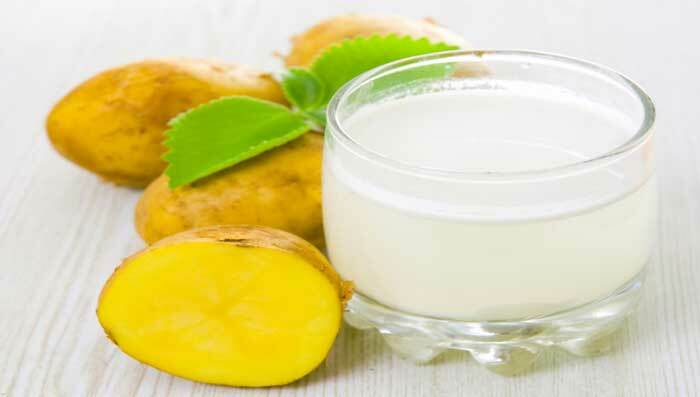 This potato and yogurt mask helps to wash off excess oil from the hair. Yogurt also cleans the hair off impurities and moisturizes the scalp. Result: beautiful, problem-free, smooth hair and natural long hair. Both lemon and potato juice for hair growth work tremendously well, boosting the hair texture and growth. Both the ingredients also help in covering the grey hair naturally, giving shine.